The good news for 63 of the 64 teams earning an invitation to the 2013 Women's Basketball Tournament is that Brittney Griner and the Lady Bears of Baylor have shown they can actually be defeated this season. The bad news for all of those teams is that Griner and company seem committed to not losing another game. To the surprise of no one, the Lady Bears were awarded one of four No. 1 seeds when the women's bracket was unveiled on Selection Monday. The other three No. 1 seeds went to UConn, Stanford and Notre Dame. All four of these teams earned No. 1 seeds in the 2012 tournament. 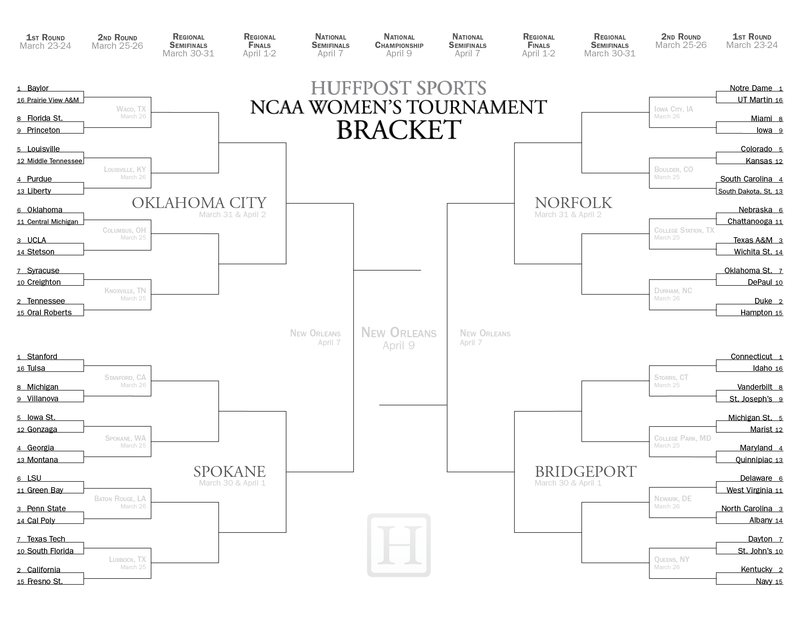 CLICK HERE for your printable bracket for the 2013 NCAA women's basketball tournament. Unlike last season when Baylor rolled up a 40-0 campaign that culminated with a national championship, the Big 12 powerhouse was dealt a defeat during the 2012-2013 season. Of course, after Stanford edged Baylor in November, the Lady Bears reeled off 30 straight wins en route to a perfect Big 12 season and overall 32-1 record. Will one of the other No. 1 seeds knock off Baylor in the tournament? Can the Cardinal do it again? Could Elena Delle Donne lead No. 6 Delaware out of the Bridgeport Region headlined by UConn? Can Notre Dame reach the Final Four in New Orleans and exact revenge for last year's title game loss? Or will Griner end her storied career with back-to-back national championships?